or keep scrolling to search for Calgary Luxury Properties within specific communities. Family community with green spaces and ravines, community center, and new schools. Access to both the Calgary city centre and Banff, including Stoney Trail, 16th Ave and Crowchild Trail. Established family community close to shops and malls with easy access to Stoney Trail. Good ethnic facilities close by. Many executive style homes and golf course. Area features include a lake, community center, mountain views and easy access to C-Train and Crowfoot shopping center. Newer family neighbourhood with community center. Close to Country Hills shops, cinemas, restaurants and Stoney Trail. Older family community close to the city and Foothills Hospital. Near the Bow River and Edworthy Park. Diverse community with newer "infill homes" and older homes on large lots. A mature, established area with excellent schools and a new community center, close to Foothills Hospital and downtown. Mixture of new "infill" homes and older character property. Bordering onto NW Calgary city limits, Bearspaw is known for its acreages featuring upscale homes with breathtaking mountain views. It is an ideal community for those still wanting the benefits of city life, but with the peace and quiet of the great outdoors. Its country lifestyle is reminiscent of its rich history of dairy farming and pasturing cattle, with some farms still active today. Just SW of Calgary’s city limits, Elbow Valley is a rural community in the MD of Rocky View County. 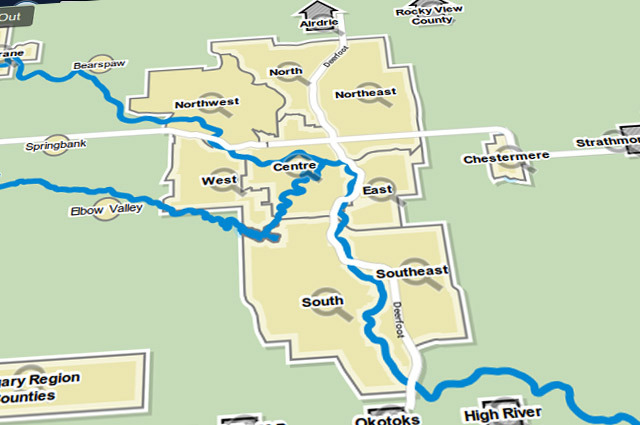 Its name comes from the Elbow River which flows directly into the Bow River. It encompasses some of the Calgary region’s most luxurious properties and is known for having a community that is dedicated to preserving the natural beauty of the land. The Upper Mount Royal area (along with Elbow Park) is one of Calgary's wealthiest neighbourhoods, home to some of the city's most prestigious and expensive estates ranging in age from brand new to nearly 100 years old. Originally an enclave of the city's American born business elite, the neighbourhood was originally known as "American hill". Riverside living in one of Calgary's most prestigious neighbourhoods. Homes line the banks of the Elbow River with quiet parks and high end shopping nearby. Elbow Park real estate usually doesn't last long. The area is known as Calgary's "Old Money" district, and that image is borne nicely with many winding, tree-lined streets of early 20th century estate homes. Walk to work, no need to drive! Ideal for Buyer who is looking for Executive Condo or Pent House Suite. Close to Princess Island Park, YMCA, restaurants, Chinatown, shops, Bow river views and park pathways. Just southwest of Calgary's downtown area, this community features many older and newer infill homes, good schools, and streets with many mature trees. Attractive area with great access to roads and pathways. Aspen Woods is south of Bow Trail and west of Sarcee Trail. Established in 2001, Aspen Woods is a newer Calgary community including both single-family homes and acreages. Considered a more affluent neighbourhood, Aspen Woods is known for upscale homes on luxurious large lots. Located on the western edge of Calgary, west of 69th Street immediately north of Discovery Ridge. This newer community was annexed from the MD of Rockyview in the mid-1990's, and offers breathtaking panoramic views of the Foothills and front ranges of the Rocky Mountains. Located directly West of Calgary City Limits in the MD of Rocky View Country, Springbank is a rural community comprising mainly of country residential acreages that include luxury estate homes. Completing this rural community is its own airport. Does the Calgary community support luxury and executive life styles? e.g. : Lake privileges, golf course, comparable homes, schools, access, churches, etc. Who was the builder? Is the property built to Estate levels and specifications? Does the home have appropriate upgrades to exterior, kitchen, bathrooms, flooring and professional basement or walk-out? Does the land or lot support an Executive Home? Are the land size, shape, location and views consistent with luxury or estate property? Is there access to mountain views, lakes, ravines, green space/park, golf courses, etc. Does the List Price reflect the quality of the home, community and location? We can find comparable executive homes that have recently sold, advise you on current Calgary-specific executive and estate market conditions, and offer price information. Are you looking in Inner City for a Penthouse Condo or a newer Infill Home? Or are you looking for an Acreage Home on 10 acres? Or are you looking for land to build an executive estate home on? Whatever your Calgary Real Estate needs we can provide the knowledge and experience you expect when selecting a Calgary Executive, Estate or Luxury Home. Please call 403 608 5682 or email for more information . CALGARY — The highest priced MLS® sale in Calgary this year of over $5 million took place recently for a property in the Elbow Park/Glencoe neighbourhood and was the fifth highest sale ever in the city. John Hripko, REALTOR® for Royal LePage Foothills who listed the property, said he defines the "luxury" market as homes priced over $3 million and "it's extremely active so far as for the number of inquiries, showings and interest in the product." "It's just a matter of the public finding the home that fits their needs," he said. "Many of them don't want to go through the process of a two to three year cycle of construction. But they're buying existing newer homes. I almost find that, personally, in the last six months virtually unprecedented demand or contact for this type of product." The Elbow Park/Glencoe property, which had a list price of $5,590,000, sold on December 10 for $5,050,000 and was on the market for 101 days.